"Everyone does, at first, and then they are made sorrowful. No-one who loved her ever failed to suffer for it. Nor could she feel remorse." 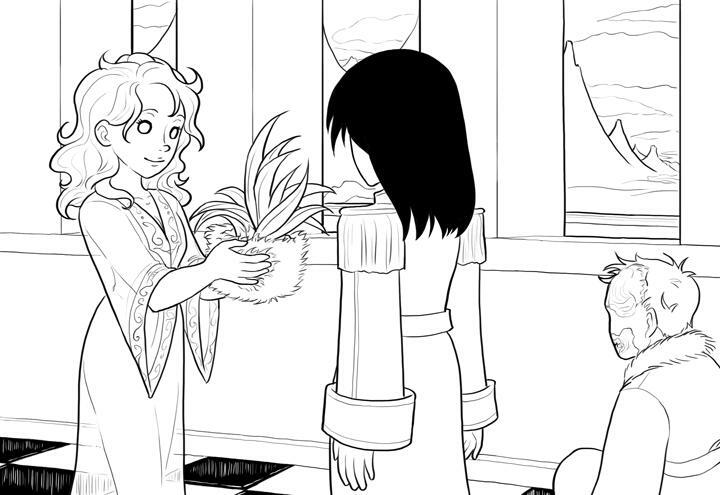 Olive Branch was a daughter of The Wizard of el-Efbaum, Charlie, and started life as a Florist in his service. She was described as having "long golden hair".IPTSF Text 12 Her Hippiemancy was integral to Charlie's efforts to preserve the side from a two front war with Easteros and Westeregg. Eventually, el-Efbaum and Haffaton formed an alliance. Pooling their casters, they were able to cast a Summon Perfect Warlord Spell to summon Judy Gale. The spell croaked the ruler of Easteros outright, and Judy Gale was able to croak Westeregg's ruler with Olive's help. Upon acquiring the Arkendish from one of the defeated sides, Charlie began performing experiments. Using caster links, he opened Olive's mind to ways of emulating other disciplines with her own. In doing so, she accidentally discovered that some applications of Flower Power could be used as a form of mind control. At some point, she also linked up with a couple of Haffaton's casters, Maxwell and Tina, and together, they developed an addictive flower that came to be known as the heroine bud. Olive was a thoroughly treacherous and sociopathic individual. While in service to el-Efbaum, she made at least 10 counts of fratricide. In addition, attuning to the Arkendish changed Charlie, causing him to lose the will to fight. Irritated at his newfound pacifism, Olive attempted to use her Flower Power, including the heroine buds, to influence him to conquer again. When this failed, she attempted to murder her father with poison. Charlie cheated death with his Carnymancy, but at a terrible price. Olive fled to Haffaton. She had already brought Lex Doothis under her sway using Flower Power. She was able to make Haffaton conquer el-Efbaum, though Judy Gale chose to have mercy on Charlie, much to Olive's displeasure. Charlie was ultimately carried off by some archons from a far off side, and was able to establish Charlescomm a safe distance away. Charlie remained addicted to the heroine buds, but found a way to survive. Olive came to be the Chief Florist of Haffaton.IPTSF Text 9 Olive murdered Lex Doothis and attempted to murder his heir, Judy Gale. This failed, but she was still able to turn Judy into a flower-addicted puppet and kept her prisoner in the Olive Garden. This has allowed Olive the freedom to manage the Side however she wishes, and the plausible deniability during parleys of only being the Chief Caster for her side, and not the real power. Delphie Temple met Olive at least once in Magic Kingdom - supposedly to parley and discuss a proposal of peace and alliance from Haffaton.IPTSF Text 9 After Goodminton reclaimed the city of Goodfinger from Haffaton, Wanda found and wore raiment that - according to Delphie - originally belonged to Olive. Delphie claimed that there is some Signamancy and even Date-a-mancy between Olive and Wanda, and that their Fates are intertwined.IPTSF Text 9 This was tragically proven true, after Olive poisoned Tommy, destroyed the Goodminton side, and captured Wanda. Tina was unable to force Wanda to turn, but Olive Branch succeeded using her heroine buds, and Wanda spent many a miserable turn on the Haffaton side. Olive Branch was very proud of her discipline and obsessed with the superiority of the Life element. Haffaton once had a large number of powerful casters that were responsible for a lot of the side's success. In spite of this, Olive Branch caused them all to die from heroine buds in order to "prove" the superiority of her own arts, eventually leaving no casters alive except for Wanda and herself. Spurred on by a prophecy, a side named Faq began searching for a capital to conquer, in order to escape destruction at Haffaton's hands. Thanks to Jillian's recklessness, Haffaton took her prisoner, discovered Faq's existence, and conquered all of their cities. However, the court of Faq managed to escape and eventually came to threaten the Haffaton city of Efbaum. Olive was Heir Designate to Judy Gale, Overlady of Haffaton. While she effectively ruled Haffaton, Duty prevented Olive from directly acting against Judy by croaking her personally. However, her Loyalty was so low that she was still perfectly willing to leave a unit likely to murder her nearby, namely Jillian, who was Predicted to kill the ruler of Haffaton. To keep her ruler better under her grip and possibly to increase the chance that Judy would be the ruler fated to croak, Olive took away the Arkenshoes her ruler owned, making it difficult for Judy to flee. Wanda managed to use Findamancy to recover the shoes and return them to Judy. As Judy departed from Erfworld, Olive became the new ruler of Haffaton, which in turn made her the likely subject of Jillian's prediction. Realizing the danger she was in, Olive tried to flee. Fate protected her from being croaked outright, but it enabled her capture, so that she could be put on trial by the court of Faq. Wanda Firebaugh was unable to provide any evidence as to Olive's wrongdoing, and King Banhammer didn't want to croak her anyways. So Faq merely tried to continue holding her hostage just in case Haffaton or their natural allies, the High Elves, attacked. But then, the Olive Garden was set on fire, releasing fumes from the Heroine Buds, and creating enough of a distraction for her to escape and become a fugitive. Olive managed to reach the city gate and called out to the surrounding army of High Elves for help. To her dismay, her allies ignored her orders and did nothing to help her. She lifted the portcullis and went under it to escape. But at Wanda's suggestion, Jillian ordered the portcullis to shut, croaking her. Wanda uncroaked her body shortly afterwards. "Olive Branch" probably refers to a branch of the olive tree – a symbol of peace or victory from the times of Ancient Greece. At her death, the High Elves sing "ding dong", which is a reference to a song played in one of the film adaptations of the Wizard of Oz, when the munchkins are celebrating the death of the Wicked Witch of the East. "In 1993 W. Geoffrey Seeley recast the story as an exercise in treachery, suggesting the supposed "Good Witch Glinda" used an innocent, ignorant patsy (Dorothy) to overthrow both her own sister witch (Witch of the West) and the Wizard of Oz, leaving herself as undisputed master of all four corners of Oz: North, East, West and (presumably The Emerald City) South. She even showed her truest "Machiavellian brilliance" by allowing the story to be entitled after the weakest of her three opponents. Glinda could have told Dorothy that the "silver slippers would easily do the job [of returning Dorothy to her beloved home] but decided that a destabilizing force such as Dorothy might be just the thing to shake up her other rival [The Wizard Of Oz]."" This page was last edited on 24 February 2018, at 12:59.